Blake etchings. Eight relief hand-coloured etchings discovered by a book collector between the pages of an international rail timetable bought in the late seventies from a ‘North London book dealer’, and recently acquired by the Tate for £441,000. Apparently, the reason suggested as to why the dealer hadn’t bothered to check through the huge timetable before putting it out for sale was because it was so ‘ boring'. Questions must be asked. Why was an out-of-date timetable so much less boring to the new purchaser ? Was he enchanted by the notion of using the book to plan an imaginary journey through mittelEurope, or had he, on a cursory inspection of its pages, spied some interesting looking prints within? We must, I suppose, take the anonymous vendor’s word. It certainly took him long enough to decide on a valuation---nearly 30 years. Come to think of it big, fat international timetables, like bound volumes of respectable Victorian magazines, are good places to hide fragile papery items. They can be safely preserved and flattened beneath the three pound weight of pages. I myself once found a rare early etching by Whydale between the pages of Punch. But to return to the mystery Blakes, there is a novel to be written here—a crime caper or thriller. Did the purchaser hide his new purchases in the timetable on returning home from an art-buying expedition to the continent ? Or was this an attempt to conceal the prints from burglars, after which he forgot about them. Perhaps he lapsed into Alzheimer’s soon after hiding them. It’s possible ! Another Blake item. In the recently published account of John Gilkey, Allison Bartlett’s The Man Who Loved Books Too Much, which is set to become a classic of its kind, a dealer recounts viewing an auction in London and finding in a bureau drawer a copy of Blake’s Book of Job in which had been tucked his even rarer Song of Liberty. The bureau was estimated at about $2,000, the Job was worth at least $100,000. Obviously rejecting the Gilkey option of trousering the book and walking out of the room with it, the dealer. oddly, decided not to bid for the chest either. He doesn’t say why, but he may have reasoned that someone else had noticed the book and had decided to bid, prompting a bidding war. Or, perhaps someone had opted to steal the book at some point, in which case our friend would need to keep his eyes on the chest almost up to the point of sale. As it was, the dealer informed the auction house of the hidden treasure before the chest was sold. The four-page Song of Liberty was duly removed and later fetched $25,000 at auction. We are not told what happened to the Job. Personally, I would have taken my chance and bid for the chest. Moral. Always look in drawers. The redoubtable John Harris, expert on architectural drawings, was always peering into them on his numerous forays into abandoned country houses in that golden age after the Second World War. In his No Voice from the Hall (1998) he recalled finding a Georgian porcelain tea set and jewellery in drawers and also the remains of ancient libraries left to moulder on shelves. And it was in a drawer of the bookshop in which he worked as a youth that cult Sci Fi guru Brian Aldiss reported finding copies of Wyndham Lewis’s BLAST, a legendary rarity ( see his autobiographical The Brightfount Diaries ), though when I questioned him about this he admitted that he had made it up. Not a surprising location, you would imagine. But there are finds and finds. 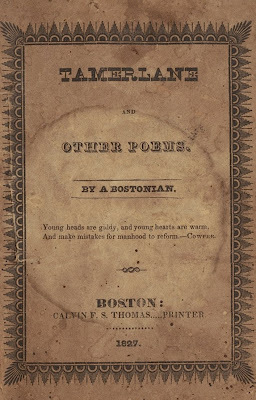 One of the rarest first editions in American literature, Tamerlane and other poems , a forty page pamphlet published pseudonymously at his own expense in 1827 by the 17 year old Edgar Allan Poe, was found in a box of agricultural pamphlets in a New Hampshire antiques barn in 1988 by a lucky dealer who recognised its worth and secured it for $15 .Only a dozen copies are said to exist. This one sold not long afterwards at Sotheby’s for $198,000. God alone knows how many interesting medieval and later manuscripts ended up scrunched up in the hands of some monk, aristocrat or bookseller in the days before toilet paper, but a few were preserved , albeit performing the marginally less undignified duty of stiffening a binding. Solomon ‘ Potty ‘ Pottesman, an obsessive collector of incunabula, was aware of this common practice and when, on one particular occasion, he removed from a seventeenth-century binding some sheets from the ledger of a bookseller working in 1603 which proved that Shakespeare had followed Love’s Labour Lost with Love’s Labour Won, he generously sold this evidence to an impoverished Shakespeare scholar for a sum far below its real worth . How many dealers would do that today ? There is probably a whole book to be written on the subject of treasures discovered in municipal waste sites. When in 1970 we had a family holiday in North Wales and for some reason we decided to park our camper van on the edge of Caernarvon’s rubbish tip, I found at the bottom of a cage-like incinerator twenty or more scarce leather-bound volumes on early nineteenth century colonial history, some of which I still have. Later on in the seventies I picked up a first English edition of Melville’s Typee by the roadside leading into the main part of the municipal tip near my home in Swansea. I remember a 'north London book dealer' telling me many years ago how he bought a collection of old European railway books from the widow of a railway professional, after one of the snootier dealers (Rota?) had passed them up, and moved them on for a very pleasing profit. I wonder if these two stories are in any way related? It's easy to see how a book of timetables might fall by the wayside in such a transaction. A more obvious place to look for that "hidden" gem - a bookshop (what's that?) window. Many years ago I was book hunting in Tunbridge Wells and environs and fairly early in the day bumped into a fellow book dealer who, dammit, dealt in similar kind of material. We exchanged pleasantries and then went our separate ways (but naturally clocking in which direction he went). My next port of call was Hall's and the blessed Sabrina but imagine my chagrin to find on opening the door that my opponent already scanning the shelves within. This time we barely nodded to each other and on finding nothing he scooted off to the next shop (when there were other shops to scoot off to!) at a fair lick. I didn't want to seem ungracious by quickly following him out the shop so hung around a little, picking over a few crime fiction reprints tucked away behind the window. I made my farewell and left the shop and turned down towards the main road, pausing to scan the window. And there, in all its scarce glory was a dustjacketed copy of Agatha Christie's Dumb Witness. I made a re-entry into the shop redolent of an Apollo space-craft re-entering earth's atmosphere and bagged the beautiful thing for £30. Moral of the story: Never be in too much hurry that you can't stop and stare in the shop window. Finds like those written about by Mr Healey are the sort of thing that come in to your mind when you spot some old books in a pile of rubbish - "ah well I know it's probably nothing, but just in case..."
The scarcest thing I ever found in a book was a WWII bookmark promoting ciggies for soldiers - Our Fighting Men long for a smoke'. It has a lovely photograph of a chubby nurse lighting a fag for a bedridden bandaged Tommy. For me the best story about a 'find' is in Sir John Squire's Grub Street Night's Entertainment', in which an impoverished book runner browsing at a book auction discovers (not just by luck, he recognises that the words can only be by the Bard). Love it. Last year, I was chatting about literature to a hairdresser, who said the only poet whose name she knew was Philip Larkin. That was because her father, who used to buy household effects from deceased estates for resale, had acquired a small washstand (and maybe more, I don't know) from Larkin's house. When moving it, he discovered a manuscript jammed between it and the wall. She didn't know what the manuscript was, but said he sold it for a good sum. Apocryphal? Apcoryphal surely - would believe a girlie mag! I do know someone who found a jiffy bag of letters from Agatha Christie to her editor stuffed behind a heating pipe. Absolutely true.